Discussion in 'Indivisible' started by Kit Ballard, Oct 8, 2015. Oh thank goodness! He was one of the people I was most hoping would hear about the campaign. It's so hard to connect to folk on his level unless you get a face-to-face opportunity though. Hopefully he'll check it out, or at least be given another reminder from someone else he trusts through the Thunderclap. Btw, Dante is involved with a Mirror's Edge style game project that's currently on Kickstarter called Failsafe. Unfortunately their deadline is coming up right at the start of Indivisible's last week, so most of us might be too strapped to help, but I wish 'em luck! So, where do we find these fans? Better yet, how do we find people who'd want HtS/B and haven't quite made the jump to buy them yet? Notably, the campaign effectively makes How to Survive on sale for five bucks. Better yet, who'd like to spend a hundred bucks for a copy of Brothers? yeah, to me those two games don't feel like they're worth $100 alone. Especially HtS, I've seen that go down to $.74 CENTS on steam. Brothers, a little bit past $1.50 on steam, but that was back in 2014. Granted you'll be paying $15 for HtS, $15 for Brothers, and $60 for a physical copy of indivisible + a $30 digital code for indivisible + the OSTs. So I think that's how they can justify it, but those two games don't seem inciting. Cas Chronon, SkullMan and ajtpak like this. 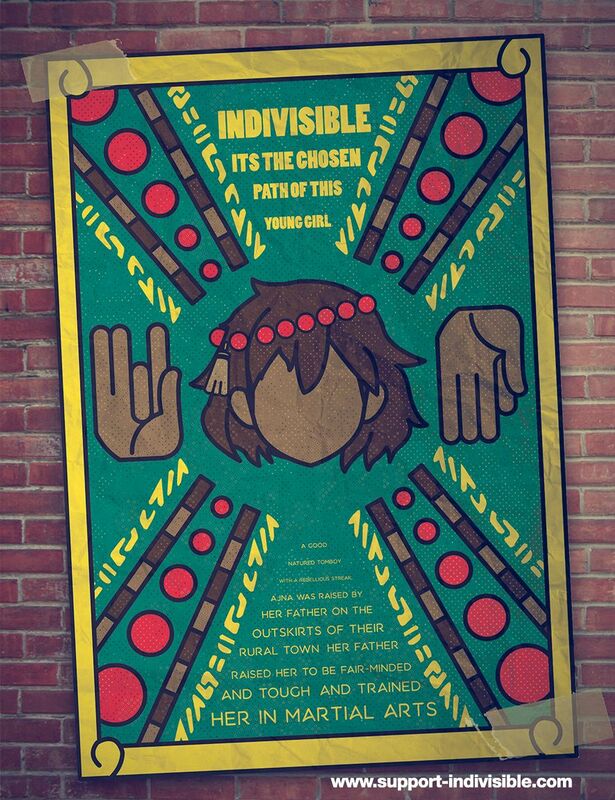 Final poster to Advertise the game, Ajna turns! I try more a minimalist style please spread the word! Nomad, Cas Chronon, KaboomKid and 6 others like this. Today shacknews.com posted an interview with some of the Lab Zero crew about the game and campaign. Ah, thank you! I saw this mentioned somewhere this morning but couldn't find the site. A gigantic, black and headless being with shapeshifting abilities that resides within dark places and abandoned houses, feeding on snakes and insects by stuffing them into its neck stump. It is also fond of women's underwear. Has anybody tried contacting Maximillian about making a video? He seems interested in the game, judging by the fact that he's streamed it several times and keeps re-tweeting campaign updates, but for some reason he hasn't put out any videos about it for either of his channels. This may have already been answered in the thread but I'm too lazy too check: Do Hassam and robo fist girl fall in the steampunk category? 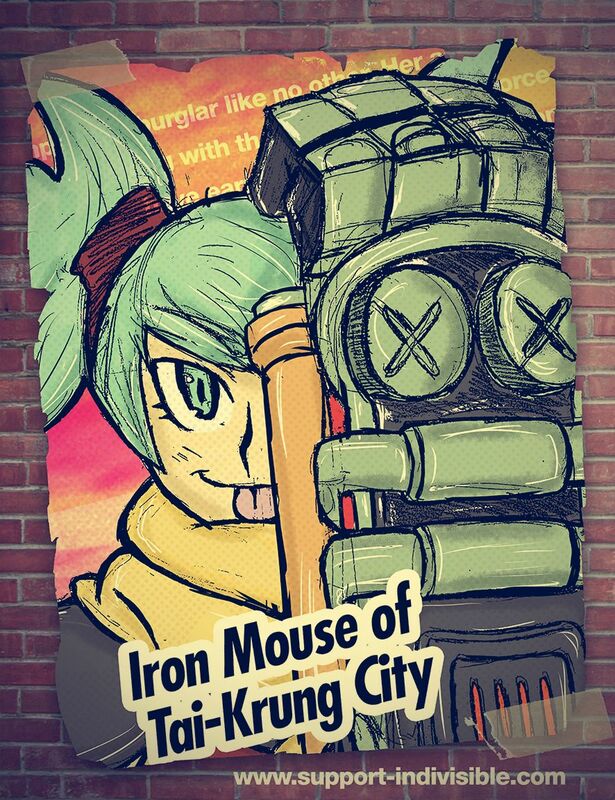 Because if they do somebody should try to promote it in steampunk reddit or something after they reveal giant arm girl. Do Hassam and robo fist girl fall in the steampunk category? Hassam and the Iron Kingdom as a whole do indeed have some steampunk themes going on about them. Not sure about power fist girl until we see/read more on her soon, though I'd wager a careful "likely". The West has accelerated knowledge as a result of an industrial revolution, due to exposure to remnants of previous worlds consumed by Kala, left behind while she was roaming. As such, some of their technology may incorporate out of place or alien looking components, not typical of the West overall steampunky look. They have more advanced war machines, including airships. This has led to an empire called the Iron Kingdom, which has taken over all the settlements in the West, and is beginning to invade the North and South. The city built with giant gears is from the Iron Kingdom, an empire rapidly expanding as the result of a rigorous industrial revolution, based on Victorian-era London. The land in the west is polluted and damaged beyond repair as a result of the accelerated growth, and is a motivation for invading the resource rich south, under the pretence of unifying the realm against Kala. 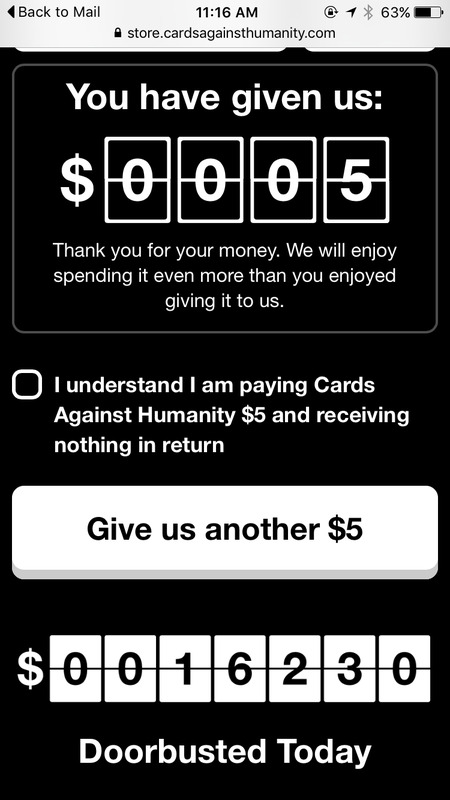 So... Cards Against Humanity has raised $16K for literally nothing today. And we're having trouble. I am sad. Did anyone try telling Cryaotic about it? Some of us have, but you should message him too if you haven't yet. While you're at it, go ahead and contact all of the other streamers/LPers/etc. you're currently thinking about too. There's not much time left, so when you feel the need to tell someone about the game, just act on it! Kai, Muro, KaboomKid and 6 others like this. Man, it's gonna take me a few days to finally quit the habit of looking at the IGG page periodically. Obviously there's no way the campaign will ever be boosted back to its old numbers, but it's hard not to feel a little anxious when it's still sooo close to those next two Stretch Goals. Right now this post-campaign pace is really impressive, and it's going to be a little sad to see it dip over the next week. Something that's been nagging at me since last night though, was how the funding rate seemed to slow down a good bit once the timer said 0 Hours Left. I get the feeling that there were probably a decent amount of people that were ready to contribute at the last minute, but they thought 0 Hours meant it was already too late, and so they bailed without bothering to check back. I think if there was just one more nice media push from somewhere, that emphasized the campaign's current InDemand status, it might be possible to pull some of those folks back while the game is fresh in their minds, and they could help maintain the current momentum for just a little bit longer. Anyway, regardless of the campaign's pace from here, it's definitely the end of a chapter now. With the game now officially funded, I can't wait to see Lab Zero impress their new supporters with the updates to come. Just gotta shift gears back into Patient-mode. superj3, Kit Ballard, Wenzel and 1 other person like this. @render me and and some other people are working on making an entertainment-con in my city tampico mexico (anime,videogames, comics etc) and would like to know if we could get you permission to set up a booth with indivisible prototype demo. the plan is for the con to be held in may.